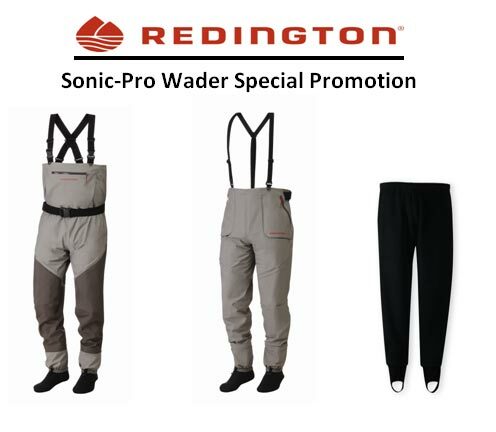 Last year Redington introduced a new line of premium waders at a mid price point called the Sonic Pro Waders and Sonic Pro Pant. These waders offer LOTS of bang for the buck. These breathable waders are constructed with high frequency Sonic Welding (no stitching) and are packed with features typically associated with much higher price point waders, such as 5 and 3 ply construction, lots of articulation, and cool built in accessories. Farbank, the parent Co. of Sage and Redington has put a ton of effort in positioning these as their flagship wader effort and the incredibly low "problem" rate in the past 15 months seems to indicate they are on to something good. From now until June 1, we are running a promotion or incentive to get you to invest in a pair or these.